Powerful changes are transforming the world of work: technology, climate change, demographic shifts, and globalization. Yet, it is quite unclear whether things will change for the worse or for the better – most probably a combination of both. What is certain is that increasing inequality and insecurity are affecting the labour market in many countries, with relevant social and political consequences. 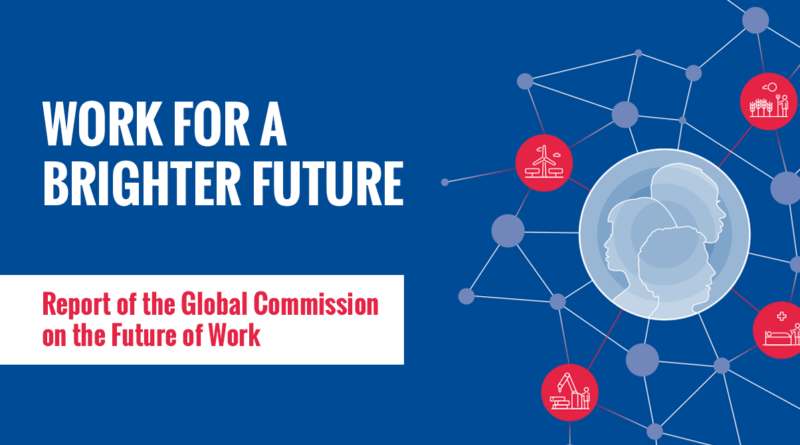 In this context, as a part of the ILO Future of Work Initiative, the ILO Global Commission on the Future of Work has produced a report on how to achieve a decent and sustainable future of work for all. The Commission, co-chaired by South African President Cyril Ramaphosa and Swedish Prime Minister Stefan Löfven, outlines in the report a vision for a human-centered agenda based on three pillars: people’s capabilities, institutions of work, and decent and sustainable work. “The ambition is not to be a technical nor exhaustive report, but rather the beginning of a journey”, commented President Cyril Ramaphosa at the occasion of its launch. Nevertheless, the report includes a set of policy recommendations, analysed below. Firstly, the Commission recommends the establishment of a Universal Labour Guarantee: all workers, regardless of their contractual arrangement or employment status, should enjoy fundamental workers’ rights. A social protection floor should ensure basic level of protection for all, workers and their families, from birth to old age. Secondly, workers must be prepared to navigate future transitions to a carbon-neutral digital age and, for this purpose, should have guaranteed lifelong learning opportunities to skill, reskill and upskill. Thirdly, the increasing role played by artificial intelligence urges to rethink the approach to technology according to the principle “human-in-command”, because human beings should always take final decisions affecting work. If “the future of work is basically putting people first”, as stated by Swedish Prime Minster Stefan Löfven, cooperatives, who are by definition people-centered, clearly fit with the human-centered agenda promoted by the Commission, and provide answers and solutions for many challenges addressed in the report. Today, about 10% of the global employed population work in or within the scope of cooperatives, and industrial and service cooperatives provide jobs to roughly 11.5 million people. Compared to conventional types of enterprise, cooperatives proved to be financially more resilient and able to adapt over time to continuously changing needs and societal transformations. Worker cooperatives, for their part, started developing amid the first industrial revolution with the very purpose of providing worker-members with better, fairer and more dignifying labour relations, and protect them with appropriate systems of welfare and social security. Since then, they have been a space for experimenting democracy at work through more and more sophisticate governance and management process, while adapting at the same time to new labour challenges and requirements. Hand in hand with overall growth of non-standard employment, there has been an increase in cooperatives established and owned by independent workers/producers, who have the double advantage of providing members with au­tonomy and mutu­alised services. On top of that, some of these cooperatives provide members with an employee status and related social rights. At this historic time, they represent a valuable solution to job instability and informalisation often linked to emerging work forms that highly affect some particular categories of workers: young people (e.g. youths active in the collaborative economy or the creative industry); women (home-based workers and pro­viders of social services); and migrants. The role of cooperatives in this field is also recognised in the ILO report, in line with the ILO’s Recommendations No. 193 and No. 204: “Workers in the informal economy have often improved their situation through organizing, working together with cooperatives and community-based organizations”. When it comes to investing in people’s capabilities, cooperatives are intrinsically committed to providing education and training for their members, elected representatives, managers and employees, so that they are able to fully take their responsibilities and contribute effectively to the development of their cooperative. Furthermore, according to a recent OECD analysis, a key-factor in accessing new required skills will be the use of high performance work practices (HPWP), that relate both to the way work is organized and the management practices adopted by enterprises. This means that the application of virtuous practices such as team work, autonomy, task discretion, job rotation and others in workplaces is expected to be a central ingredient of quality work and business competitiveness. Through their work management and participatory governance, cooperatives are a source of inspiration for innovation and sense of well-being in the workplace. As far as technological change is concerned, it is difficult to predict what the impact of digitization and automation will be on the future of work: changes are not happening homogeneously in the world and some regions are more impacted than others. However we look at the phenomenon, the quality of jobs and the “human-in-command” approach recommended by the ILO Commission are strongly linked to the issue of worker ownership, and here again worker cooperatives have something to say. As Nathan Schneider would put it, “it begins with thinking about automation like owners do, not like victims of it. In worker co-ops, rather than fearing how machines might take work away, workers can imagine how they could use those machines to make their lives easier”. The report “Working for a Brighter Future” results from a 15-month examination by the 27-member commission, based on figures from business and labour, think tanks, academia, government and non-governmental organizations. It will be submitted to the Centenary session of the International Labour Conference in June 2019. To conclude on a challenging note, while the human-centered economy approach is a positive, laudable and helpful development, we cannot help but point out that more needs to be done in terms of enforcement and implementation of the ILO standards and normative concepts. To know more about CICOPA’s vision on the future of work, read our strategic paper The Future of Work: Where do Industrial and Service Co-ops Stand? ← May the cooperative model save the local media industry?